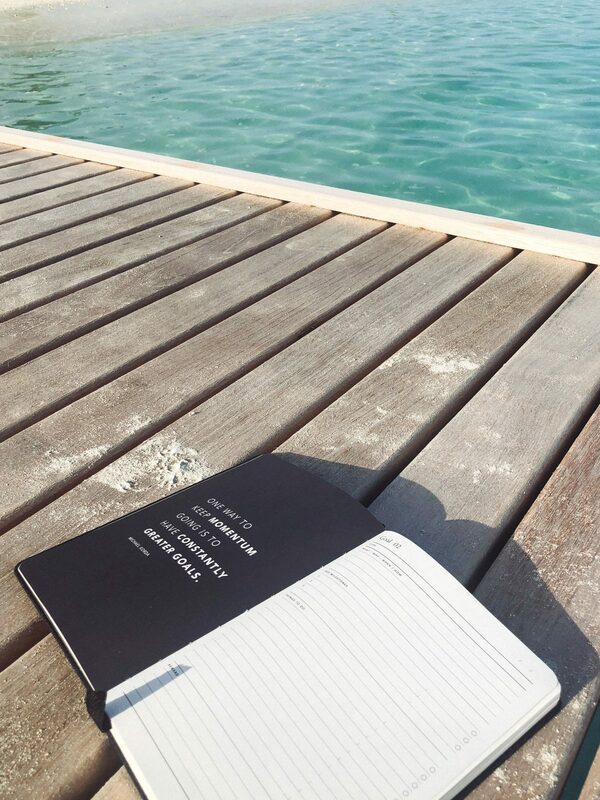 We used our MiGoals Progress Journals on our latest retreat in the Maldives to encourage mindfulness, reflection and progression. I have a daily ritual of journaling and I wanted to share this with our students, and show how setting an intention for the day or week can really plant a seed for internal and external progression. We are incredibly habitual and what better way to create new and lasting habits whilst on a retreat?! I believe giving mindful attention to your experience will increase your awareness and help you to better understand yourself, others, and the world around you. Use this time to be reflective on what you are truly grateful for. Through your writing you will discover that your journal is an all-accepting, non-judgemental friend. Write exactly how you feel without censor and practice authenticity along the way. Don’t forget to include the small things. Create an action for each day in your journal to spark growth. Step out of your comfort zone and take action towards a goal. Measure your growth and celebrate the wins. In addition to all of the health benefits, keeping a journal will also allow you to track patterns and growth over time, specifically in 90 days with the MiGoals Progress Journals. I like to think of it as collecting valuable data which you can call upon. By referring to your journal you will find information which you may choose to apply as a potential resolution. Think of it as your own, personal, emotional recipe book. With MiGoals being part of our retreat, it gave people an opportunity to partake in this self emotional management tool facilitating a process which can allow you to regulate mindful attention to build better self awareness, reduce stress, develop clarity and our favourite; a practice of gratitude! Read on for our interview with MiGoals founder Adam Jelic. Here Adam shares his tips for setting meaningful goals. How does setting goals help lead a more meaningful and happy life? Because when I think about leading a more meaningful and happy life, firstly, I have to know what it looks like for me. If you don’t actually know what that means for you, you’ll start to want everything and achieve nothing. Once you’ve gone through the process of figuring that out, the importance of setting goals should be at the heart of everything you’re striving for. If your goal is to be able to live a comfortable life with a good career, then set goals that allow that to manifest. If it’s to be able to run your own business and own your own career – set goals there. And if your idea of a meaningful life is to be more present with your family and friends, set your goals around being able to fulfil that. What “out of sight, out of mind” means in this context is, if you don’t know what you’re working towards, you’ll work for nothing. Keep your goals at the centre of your work ethic and all the “other things” in life that aren’t important to your goals will be second priority. What are the benefits of using a Progress Journal? The benefits of using a Progress Journal are endless. However the main benefit of using a Progress Journal is that it allows you to live each day with intention. Being connected with yourself, your thoughts and your progression will allow you to remove the BS when it comes to making progress. We all know that life has its own course and at times, things get in the way of what we’re striving for. But one thing I want people to think about is, going back to goal setting, if you don’t know what you want, how can you achieve it? If you don’t know how far you’ve come in relation to a goal you’ve set, how will you know how far away you are from achieving it? The Progress Journal is a 90 Day Journal that allows you to break down each day in to actionable steps for a goal of yours. The idea behind it is to allow you to set tangible milestones and work for 90 Days to see them through. At the end of the 90 Days, you want to be able to look back and see the progress you’ve made… whatever your goals are. If you commit to setting aside 10 minutes of your day to journal, to reflect and to plan for the day ahead. You’ve already made a bigger leap in success then you ever have. Your top 5 tips for maintaining momentum and reaching your health and wellbeing goals. Momentum can a beast when it’s in your court and it can be the same beast when its not. I believe the best thing you can do for yourself is to be intentional in your living. If your goal is to be the best at something, don’t settle for anything less. Just like bad habits are hard to break… good habits are too. Set yourself up for success by creating habits and rituals that put you in the right frame of mind to succeed. Don’t do it on your own – it doesn’t work out as much. You are more likely to succeed if you have someone that can push you as opposed to being on your own and settling for average. Find someone that will keep you accountable. Do one thing each day that puts you out of your comfort zone in achieving your goals. It sounds simple, but by the end of 90 days – the growth that you go through as a person will be tremendous. Nobody is perfect! You WILL make mistakes. And that is okay! As long as you learn and grow as a person, then a mistake isn’t a mistake, it’s a lesson.